Last Wednesday, Viget hosted another Boulder Web Project Manager Happy Hour. This one focused on attendees sharing the PM Tools they use and love (or hate). It was another successful meetup, with great conversation and lots of sharing. When it came to the tools we use as PMs, it seems that we all feel like something or other is lacking in just about every case. So, we were all especially curious to hear about what works and what doesn’t in tools that we hadn’t yet had a chance to try ourselves. Here are some of the tools we discussed, and what I learned about them. I started things off by introducing everyone to Unfuddle, the bug tracking/ticketing tool we use here at Viget. The first year I used Unfuddle, I found it to be a little too cumbersome for simply adding tickets and thought it took a little too much effort to move tickets around. In the last few months, however, Unfuddle has released some updates that appear to address my two major concerns pretty well. 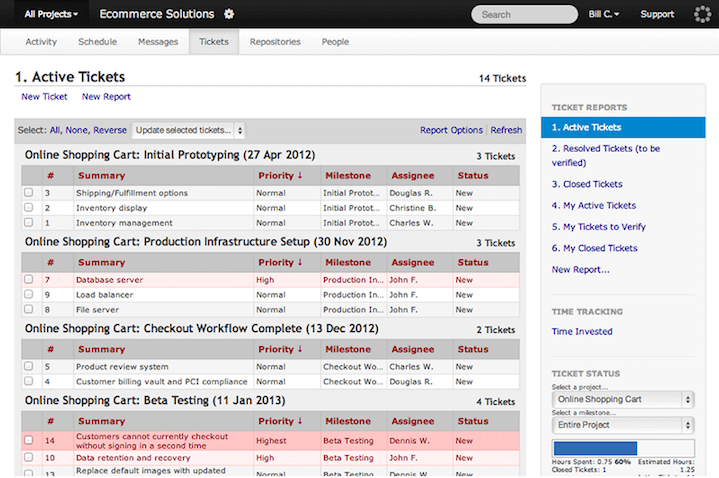 Ticket writing is now pretty simple, and a new view allows one to easily move tickets around. Assuming they continue to iterate on the updates and make improvements, I do think Unfuddle rivals most ticketing systems out there in terms of flexibility and built-in functionality. Next up was a presentation on JIRA. I wasn't very familiar with JIRA going into the presentation; but, I have to admit that my limited prior exposure had left a bad taste in my mouth. I had worked with a client who used it, and the way they managed the tool made it feel stressful to use and keep organized. We viewed a demo and heard from two members of the meetup group from two different companies (a product company and a services company). 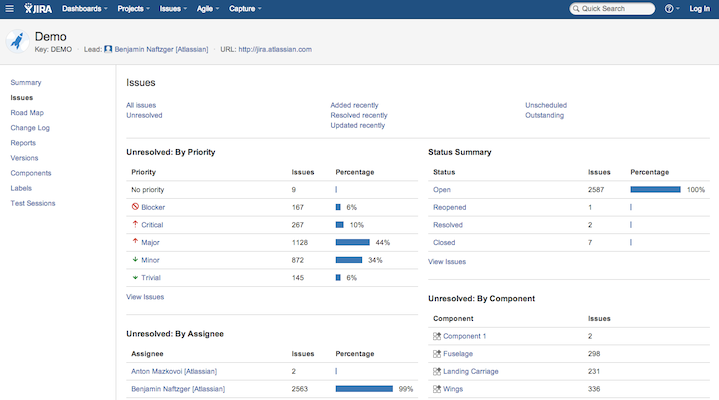 I learned that there’s more to JIRA than I had originally thought, as they showcased JIRA as a comprehensive tool with many different add-ons that can cater the experience to each company’s individual needs. This flexibility does make it sound like a powerful tool that should be considered when looking for Project Management tools. 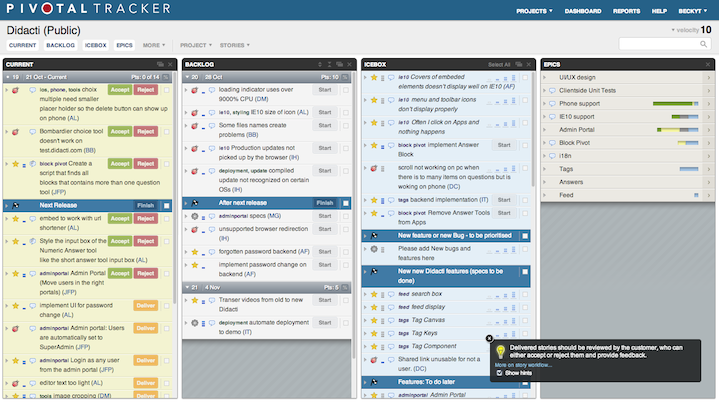 Pivotal Tracker is another popular project management tool, especially here in Boulder. Its creator, Pivotal Labs, is a local company, so their presence in the community likely makes them a favorite choice among local companies. Though I had some experience with Pivotal going into this meeting, it was great to hear what people loved about it. Pivotal is rather lightweight compared to Unfuddle or JIRA; but, what it does, it does well. If you are running a project using Agile Methodology and want to stick closely to that structure, Pivotal is likely a good choice. It’s not as flexible as other tools; but, that’s part of what can make it a great choice for those working within an agile environment. It’s not bogged down with a ton of features or options you may not need. It’s also easy to understand at a glance, making it a great option if you are working with clients and want to give them visibility into a Project’s status. Most people at the meetup were already actively using and very familiar with Basecamp, so we chose not to dwell on its basic functionality. What we did discuss was the fact that most of us had not yet made the move to the New Basecamp, but instead prefer to stick with Basecamp Classic. Basecamp Classic works well, but knowing that it’s not the primary focus of the 37Signals team means it’s likely not going to see updates or improvements. Though New Basecamp is making progress with incorporating some of our favorite features from Classic (specifically, allowing messages to be private within companies), it’s still missing some things we love and count on. That said, Basecamp in any form can certainly be a great way to enhance communication on a project and provide high-level milestones everyone can understand. A few people, including me, mentioned the use of Google Spreadsheets for various needs not currently met well enough by existing tools. One Project Manager showed off a robust spreadsheet that helps prioritize projects within a company and allow for an easy way to see if team members have the capacity to take on new projects. It can be a pain to create a detailed spreadsheet template with dependencies, formulas, multiple tabs, etc. -- but, it can be an amazing option if you have a specific need at your company. Here at Viget, we use a homegrown Google Spreadsheet template for project resourcing. It might not be the prettiest thing you’ve ever seen (and you certainly have to be careful when adding or deleting rows) -- but, it gets the job done and done well. Nobody at the meetup had used Apollo before, but I had recently learned about it at the PM Tools breakout session at the 2013 DPM Summit. 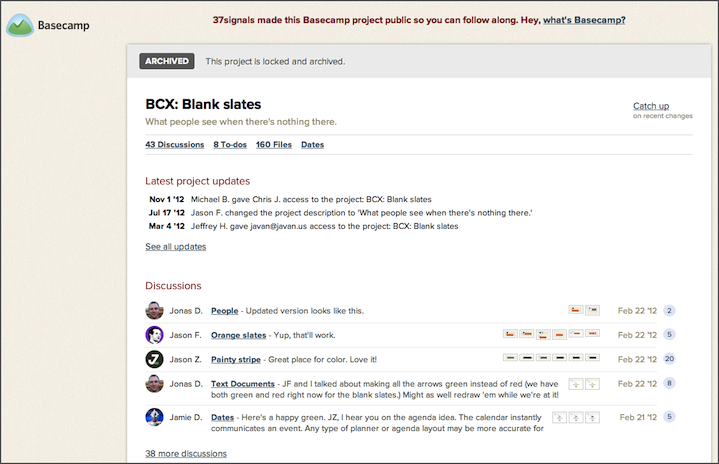 It is a service similar to Basecamp, but seems to have a few more features. I’m interested in learning more about Apollo, so if you’ve used it, please post your thoughts in the comments below! This tool was originally on the list to be shared; but, unfortunately, the person using it was not able to attend the meetup. This was another tool I had heard about at the PM Tools breakout session at the 2013 DPM Summit. I really don’t know much about it, but have heard it’s a miracle, open source tool that let’s you do whatever you want. So, needless to say, I’m interested! I’d love to hear about how it’s being used in practice. As with Apollo, if you’ve used it, definitely post your thoughts in the comments below. Those are the main tools we discussed. It was a fun night with pizza and beverages -- and a lot of chatting and commiserating. Best of all, I think we all left with a better sense of why we should keep using our tools or, in some cases, consider making a switch. If you are a Digital Project Manager in the Boulder Area, we’d love for you to join us for our next event!